Organizations and individuals (the site owner) are encouraged to link to MarineParents.com information. Advance permission is not required before linking. Links should be made using the appropriate base URL of www.marineparents.com or such other URL as the organization may use for outreach programs. Because MarineParents.com may change subpages at any time without notice, the site owner should routinely verify links to organization subpages. Click here for "Link to Us" code. What Site Owners May Not Do in Linking to MarineParents.com Websites. Site owners may not capture MarineParents.com pages within the site owner's frames, present MarineParents.com Web site content as that of the site owner, otherwise misrepresent the content of the MarineParents.com pages or misinform users about the origin or ownership of the content of the MarineParents.com Web site. 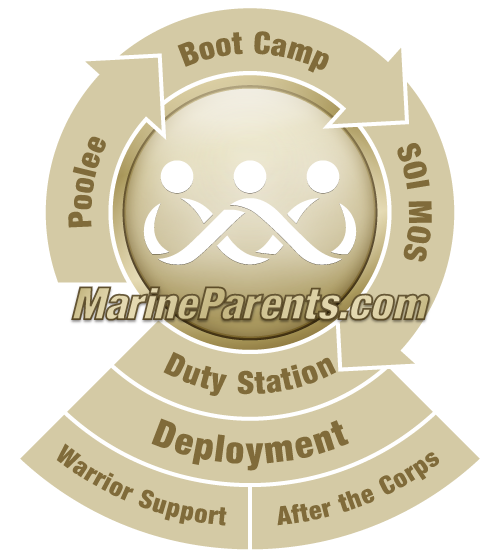 Any link to a MarineParents.com site should be a full forward link that passes the client browser to the MarineParents.com site unencumbered. The BACK button should return the visitor to the site owner's site if the visitor wishes to back out. Although the content of MarineParents.com Web sites is available to the public, certain information on some MarineParents.com Web sites may be trademarked, service marked, or otherwise protected as MarineParents.com's intellectual property, and all MarineParents.com content is protected by federal copyright laws. Use of protected intellectual property must be in accordance with federal and state law and must reflect the copyright, trademark, service mark or other intellectual property ownership of MarineParents.com. Site owners should not link to individual MarineParents.com graphics or tables within MarineParents.com pages, especially in an effort to place the downloading burden on the MarineParents.com servers. Site owners should contact MarineParents.com to request permission to use a copy of MarineParents.com's graphics within the site owner's pages. Links from any MarineParents.com Website. Links from MarineParents.com websites are provided for convenience and information only, and MarineParents.com assumes no responsibility for their content. MarineParents.com reserves the right to link to external websites that MarineParents.com feels provide a service to its members. MarineParents.com makes all efforts to ensure these links to open in new browser windows. All requests for links from MarineParents.com websites must be submitted to MarineParents.com staff. Each request will be reviewed under the provisions listed in the Website Links Policy. Non-commercial information relevant to MarineParents.com members, Marines, or those who are engaged in providing non-profit services to Marines and their families. Commercial links with a stated commercial purpose will be refused unless contracted as paid advertising. Links to paid advertising will be so noted. MarineParents.com reserves the right to refuse any link request without condition. MarineParents.com will also not link to any website or sponsor where such link will violate MarineParents.com's status as a 501(c)(3) nonprofit corporation. MarineParents.com will not link to any website furthering the political agenda or candidacy of any candidate running in any organization or agency. MarineParents.com and the Board of Directors reserves the ultimate right to refuse or permit any website link, irrespective of the above policy. For questions and concerns regarding the linking policy, email MP@MarineParents.com. Note: The Website Link Request form can be found on the "Contact Us" page or Click here for the Website Link Request form.